Your dentist has just told you that you need a root canal. You are prepared to have your tooth drilled, cleaned out, and sealed, but now you're being told that you need a crown put in place too? Why is that? Didn't the root canal procedure just fix your tooth? Root canal treatments aren't as durable as a crown will be for your tooth. They become brittle with time and will become prone to fracture. Root canals are most commonly completed on a back tooth where chewing action takes place, so it is important that this compromised tooth is protected against the strong forces that it is subjected to every day with chewing. Remember that even before your root canal that your tooth went through some considerable damage with a large cavity and infection, so adequate protection is now needed to extend the life of that tooth. A crown is the best way to protect your tooth after a root canal has been completed. 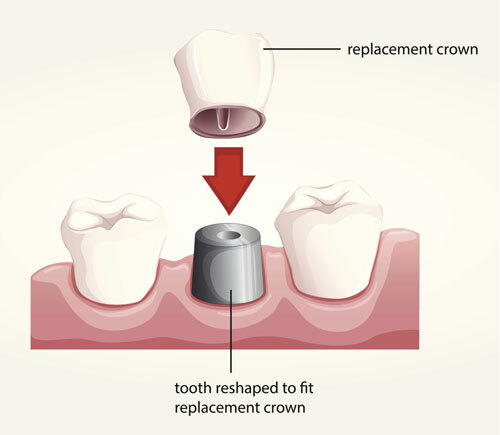 This cap-like structure will provide 360 degrees of protection and coverage to your tooth, and it can be made out of metal or porcelain. Porcelain options are more common today, and they can be created to match the size, shape, and color of your natural teeth. It will also be cemented into place to make sure that it doesn't slip out of place once it is put into your mouth. Ask any dentist, and they will probably have a story about encountering teeth that were treated be a root canal that wasn't properly protected by a crown. Likely, the patient has then suffered a fracture that wasn't able to be treated. Unfortunately, this usually results in the tooth being extracted, so it is clear that crowns play an important role in long-term dental health and protecting your tooth. Please contact us if you have any questions about receiving a crown after a root canal.